this time, there was no hurry. the day was fine as we approached duart, which stood, as ever, against the greyblue sky and the greyblue sea. i watched a distant ferry - the same in fact we would board later this day - passing the lismore lighthouse on its way to oban. 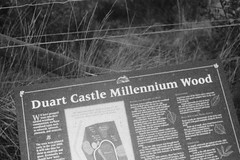 i headed for millennium wood to document each sign, so that i could tell my kids how to get here. with the mighty ancient duart and the sea complicit in my enterprise, and with lindsay listening to my rambling stories in the confines of her car while driving the tedious labyrinthine mull roads, i was anything but alone. i was in fact surrounded with home.